Being pretty rubbish at staying up late is a bit tricky when you like astronomy, so in order to keep on observing, I’ve purchased a dedicated solar telescope for viewing the sun. The Coronado Personal Solar Telescope, Coronado PST, allows you to view the sun in a very specific wavelength, Hydrogen alpha (H-a). It wasn’t cheap, it costs more than some telescopes and this will only ever view the Sun but the views do not disappoint. Of course, it should go without saying that you should never ever look at the Sun without using dedicated and safe equipment. Use the built-in solar finder, stick in the eyepiece and away you go. The supplied 20mm Kellner is utter rubbish, I managed to blag a free 12mm Antares plossl that’s a lot better than a Kellner. I’ve attached a short dovetail bracket and a solar shade and popped this on to my EQ5 mount. You can use a tripod if you wish, I found it too unstable. The Sun is a dynamic object and its surface is in a constant state of change, its my favourite thing to image on all of my astronomy viewings. A big red glowing sun greets you, prominences like flames (not real flames bust plasma) emanating from the disc edge of the sun and filaments like scars across the face. A tune of the etalon filter and active regions, sunspots and plage come into view. First light through this little 40mm scope and the Sun comes to life. Any fears about it not being able to show more than a white light filter such as Baader Solar Film are completely blown away. You don’t focus, you tune the etalon filter so different things come into view. The longer you look in H-a, the more you become accustomed to finer details on offer. Today see’s the first attempts of solar photography using the Hydrogen alpha Coronado PST telescope. To get focus using a webcam means having to use a Barlow but the seeing isn’t brilliant so I’ll use the DSLR. A high frame rate camera like the monochrome DMK21 could make some great images. As the image is already bright through the telescope, the natural instinct is to reduce the exposure. 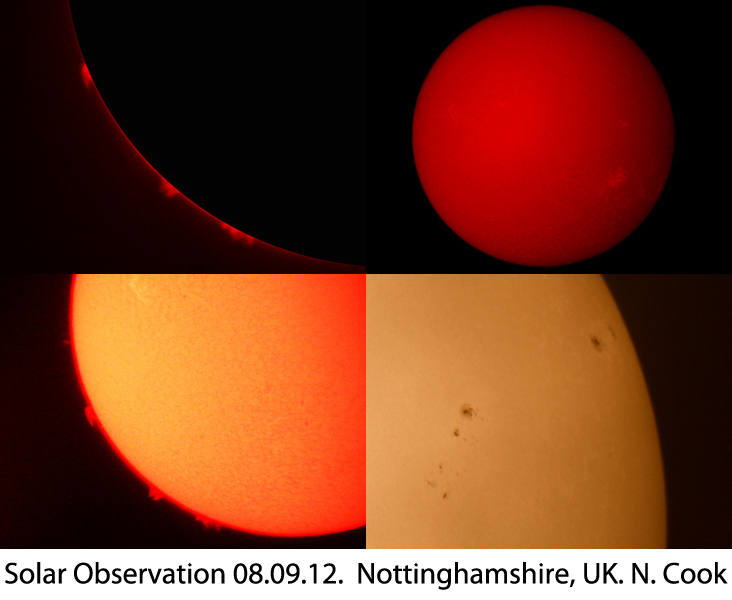 This shows the prominences well but reduces the more visible surface detail on the sun. To get any surface detail like the filaments, granulation, plage etc, you need to leave the exposure a little longer. Practice makes perfect. It’s also easier to use the viewfinder on the DSLR than Live View. The Hydrogen alpha (Ha) shows some surface detail and the prominences on the solar limb. Also used the white light Baader solar film on the Skywatcher 200p Newtonian to get an image of sunspot active regions 1564 and 1562.